The early morning sunshine doesn’t last and we are soon back to a windless, blue-grey, engine-powered day. Wherever you are, the wider world is never far away. 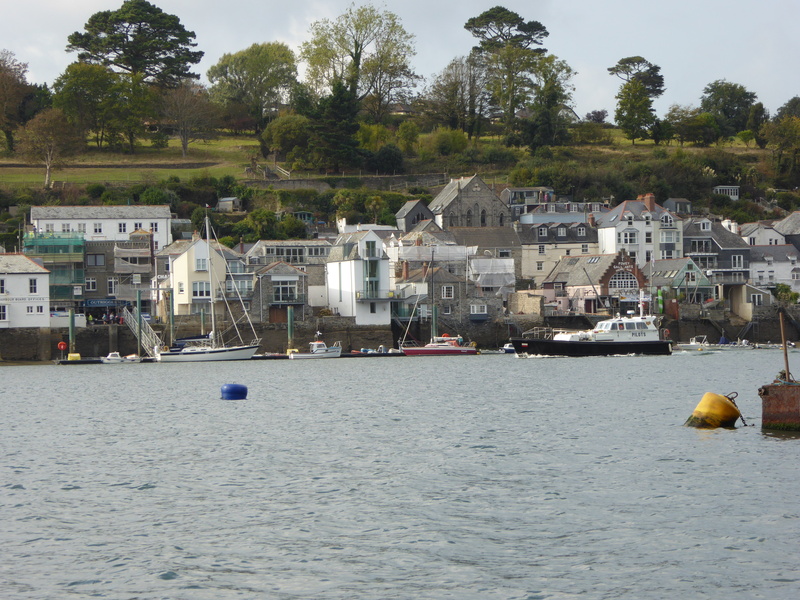 I spy Grace with her magnificent Cornish flag leaving the Maritime Museum pontoons. 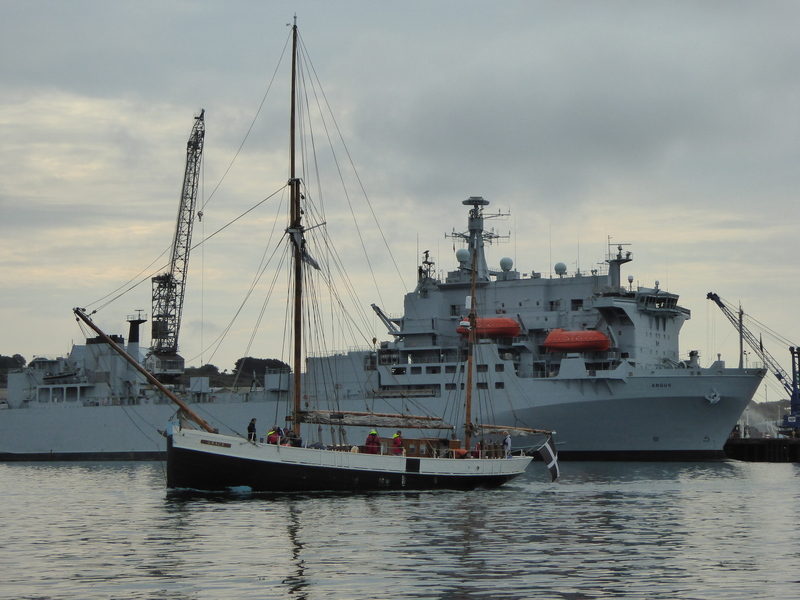 I admire her lines and recognise a smaller version of Ceres, my grandfather’s Westcountry trading ketch mentioned extensively in earlier posts in this blog. I busy myself taking in fenders and coiling lines and, by the time I get to the camera, Argus has become the backdrop – and Argus is preparing for Sierra Leone and the Ebola outbreak. Easing back the throttle to allow Grace to pass ahead, I gaze at Argus wondering how she and her crew will cope with the next few months. However fine the planning, however optimistic the talk, the here-and-now in Sierra Leone will try them to their limit. I wish them well. 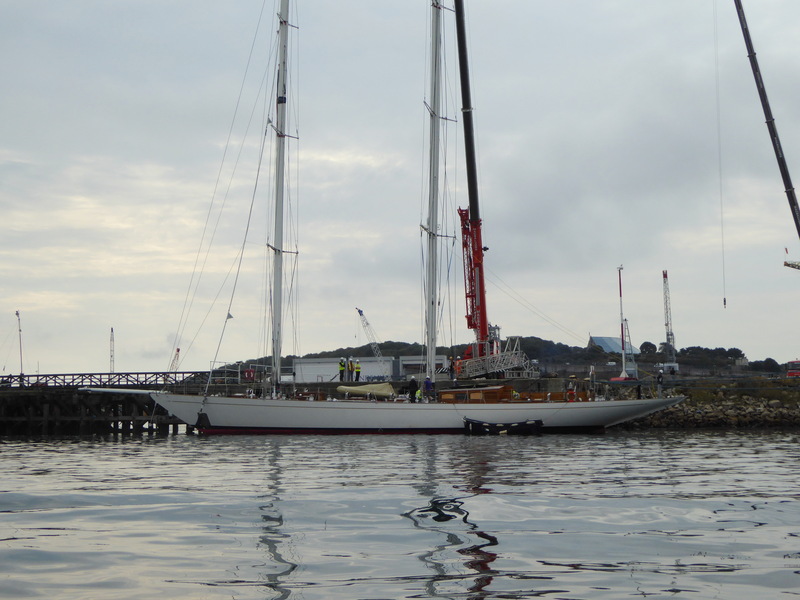 And, as if I am not feeling humble enough, I reach the next wharf where it’s just another day in the Pendennis Shipyard. 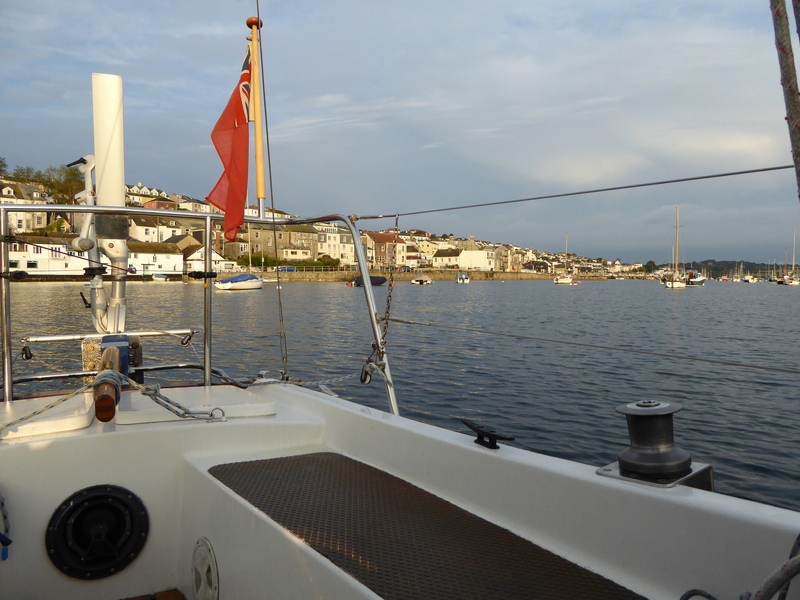 Blue Mistress and I bow respectfully and motor on – on past the Governor, past Black Rock, past St Anthony Head and out to sea. 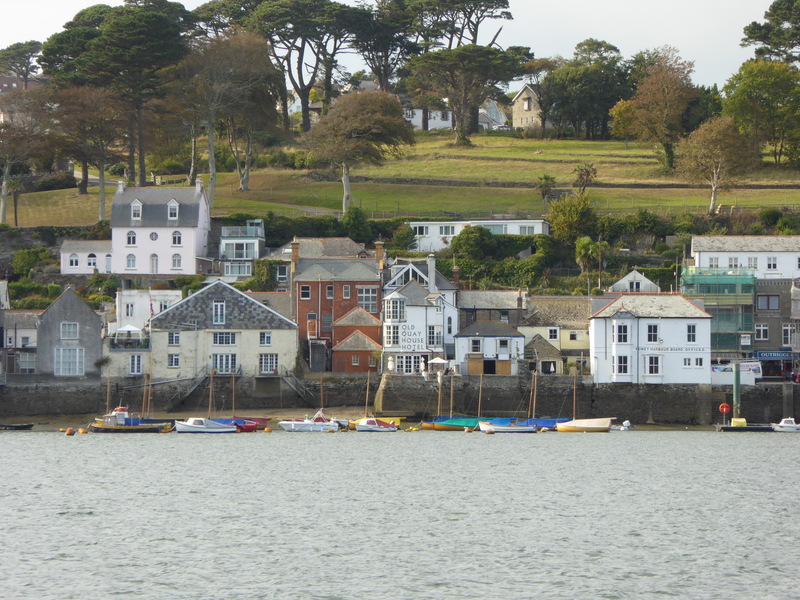 I look back and vow to return to Falmouth to explore Carrick Roads and the Helford river. 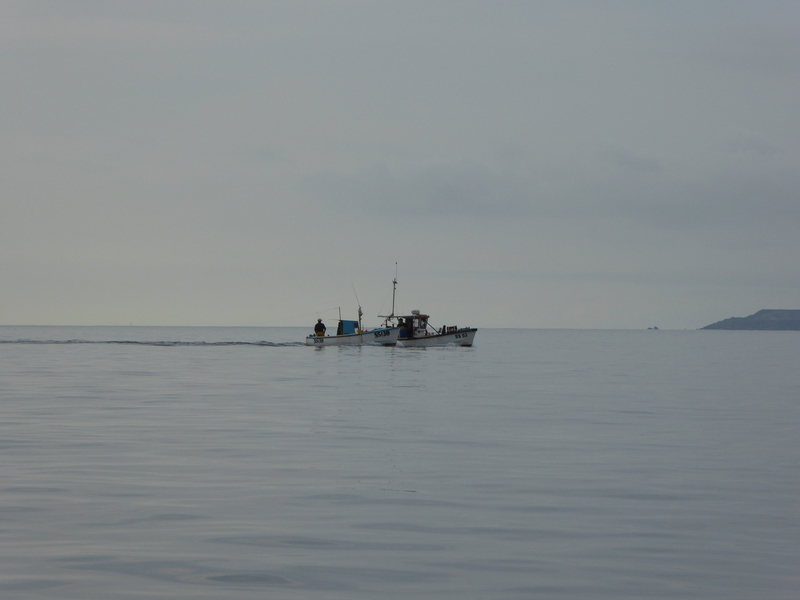 We pass Porthscatho, Nare Head and Portloe; round Dodman Point (avoiding the flagged lobster pot buoys) to clear the Gwineas buoy off Gorran Haven, then Chapel Point and Mevagissey. Crossing St Austell Bay, there is Black Head then Charlestown with St Austell, St Blazey and Par and the china clay industry behind, and now the Cannis Buoy off Gribben Head and Fowey beyond. (I should also mention the poetic Pendower, Portmellon and Pentewan, then Trenarran, and Porthpean, Polkerris and Pridmouth). To navigate I use the chart but to learn about the coast and what lies behind it, the local Ordnance Survey maps are supreme. While at sea, how else would I have noted Caerhays Castle or the ancient earthworks on Dodman Point, or locate Daphne Du Maurier’s Menabilly? Looking at this coast I wonder what the Sierra Leone coast will look like to the crew of Argus and I remember Clarissa Vincent and the ‘The Voyage of Storm Petrel‘. Clarissa took Storm Petrel down the west coast of Africa. Now there was an adventure. The end of September and the summer cruisers have gone home, the visitors moorings are nearly empty. I row ashore to the Ship Inn for excellent fish and chips and a pint of Tribute, and later experience the singular pleasure of rowing across Fowey harbour in the dark under a sliver of new moon. Pingback: Time to look around | Beyond Steeple Point . . .
Pingback: Rite of Passage | Beyond Steeple Point . . .